Welcome to the Bass Lake Lodge! 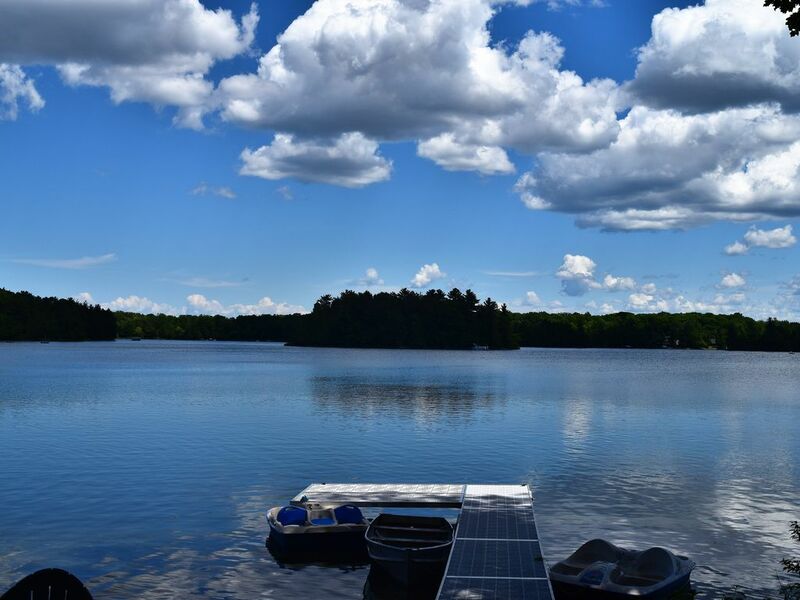 Where you will find the beauty of a quiet lake and amenities to make you feel like you are at home. Pets are NOT allowed and No Smoking inside the rental. The Bass Lake Lodge is located on Bass Lake six miles outside of Traverse City. Bass Lake is a small, spring-fed lake that is nestled between Silver Lake and Long Lake. It is a 343 acre all sports lake which offers a peaceful and quiet atmosphere. It also offers beautiful fall colors! There are four islands on the lake, each one making it more unique. There is a small public beach and boat launch which is located one mile away from the house. The south end of the lake is surrounded by State Lands and a girl scout camp, which offers a nice spot for fishing. There is lots of wildlife in, on and around the water; each year we see a pair of loons that nest nearby on the lake. And, the lake is also home to a majestic bald eagle! The Bass Lake Lodge is 1350 square feet and is filled with knotty pine paneling and tongue and groove boards throughout the home, which gives it a beautiful 'cabin' feeling. ~Winter of 2009 - new carpeting, light fixtures, drywall/paint, porcelain & limestone tile. ~The bathroom was remodeled in winter of 2010 - new tub, porcelain tile and commode. ~A new couch, reclining chairs and dining room table set were added as well. ~A custom kitchen was added in the fall of 2011; offering hickory cabinets (filled with everything imaginable to make cooking meals a breeze). A new 'larger' refridgerator (with an icemaker and water dispenser) and a dishwasher were added. The porcelain floor tile accentuates the coordinating countertoop and backsplash - which give you lots of room for preparing food. ~ a new roof and siding added late 2016. During this remodel, the wood burning fireplace was replaced with a gas fireplace. *One click of a switch and you can enjoy a cozy fire while viewing the beautiful scenery outdoors through one of the many windows facing the lake. The home also has a laundry room with commercial size washer and dryer. And, there is also private WIFI at the rental at no extra charge. The landscape of the home has soft grass (summertime) and lots of flowers. A bonfire pit is located near the water and is surrounded by a large concrete patio. (Firewood is provided for your convenience.) There is a large deck on the back of the home which overlooks the lake and a beautiful sunrise. There is a 4' x 40' non slip dock with a 8' x 16' patio on the water. The rental includes the use of a row boat and a 5 person paddle boat (summertime only). Life jackets are provided. Come to The Bass Lake Lodge to relax and enjoy beautiful Northern Michigan. Be sure to visit my website: basslakelodgetcmi.com! Read the reviews from many satisfied guests for more info! I am an original vacation rental 'owner' on Bass Lake! I have been renting out this home for 18 years as a vacation property, it is the only property that I have and it is my pride and joy! Along with my husband, we have done many renovations to the home and property over the years. It is modern but with a cottage feeling. The neighborhood is definitely the place to be! I refer to it as my own little piece of Heaven. Most of the residents in the area have been here for quite some time. It is located off of the 'beaten path' but is still close to everything! I have put a lot of thought into the rental with the intention of making your vacation as easy and enjoyable for you as possible. From linens to everything you might need in the kitchen as well as firewood and life vests are just a few of the no charge extras that I provide. It is exactly as it is advertised, no surprises! Should a problem or question arise, we reside across the street from the rental and are always a phone call away. You will never have to deal with a rental manager or agency. Previous guests have thanked me and provided me several flattering comments about The Bass Lake Lodge. Please review my "comments" from previous guests to see how truly special it really is. I hope you will be as excited to vacation at The Bass Lake Lodge as I am to live in this wonderful area! Originally built by my Father and Grandfather, the home has been part of my family for many years. Over that time, it has been remodeled and reflects all the creature comforts for you to enjoy. I grew up down the street from the home, then resided in it for several years until a job transfer moved me out of town. At which time I turned it into a vacation rental. Since then, I have moved back and now live across the street from the rental. Bass Lake is a wonderful, quiet lake. (Mostly pontoon boats, fishing boats and kayakers.) The home has a great view to the east; looking at Kennard Island. The sunrises are nothing short of amazing! The Bass Lake Lodge is in a quiet, friendly neighborhood that is conveniently located to Traverse City, Interlochen and many other area attractions. It is set on a 343 acre, all sports lake which offers great fishing, beautiful views and lots of wildlife. The rental is filled with lots of extra amenities that will make your vacation that much better! The rental has a fantastic view of the sunrise as well. And, I live nearby in case you need anything special. toilet, combination tub/shower, Medicine cabinet and full sink. Full bathroom with a tub and shower. 65' of private lake frontage. NEW August of 2018!!! WHOLE HOUSE air conditioning. Forced air heating. And, a bonus gas fireplace in the living room. All bed linens, bath towels, beach towels and kitchen towels are supplied for your convenience. Custom kitchen includes double door refridgerator with water and ice maker, stove/oven, microwave and dishwasher! Beautiful hickory cabinets that are filled with all of the cooking implements you can use - like you're at home! Custom formica cabinetry with coordinating floor, backsplash and deep double sink give you plenty of room to make meals and relax. Beautiful wood table and padded chairs to seat six people. A high chair and two booster seats are provided for children. Includes a large fire pit near the lake. I also provide firewood for your use at no additional charge. Kayak, canoe, paddleboard and pontoon boat rental available. Trolling motor rental available too! The rental includes a row boat and a paddle boat. *An 18' pontoon boat, trolling motor and kayaks are all available to rent at an additional fee. Patio furniture, both a gas and bbq grills, 4' x 40' non slip vinyl dock with an 8' x 16' patio, Aluminum Row Boat, 5 person paddle boat (includes life vests), Bonfire Pit near the lake with six Adirondack chairs, firewood is provided for your convenience (at no additional cost), lots of flowers throughout the property. No Smoking inside the rental, no pets. ***18' pontoon boat, kayaks, paddle board and trolling motor available for rent for an additional fee. We loved our stay! Jennifer is a great host - the cabin was very clean and cozy, with pretty much everything we needed. It’s conveniently located near Traverse City and Interlochen and served as the perfect “base camp” for our ice fishing trip. We even tried our hand on the all-sports lake behind the house. It was a wonderful trip! Cozy and clean cabin by the lake! Jennifer was a pleasure to work with - and left such a thoughtful welcome basket! The Bass Lake Lodge was clean, comfortable and felt like home. The fireplace was great and warmed up a chilly November weekend. Good memories! Enjoyed the beautiful view of the lake especially each morning at sunrise! Cabin is updated, spacious, immaculate and thoughfully supplied with cooking utensils/pans and really just about anything else you didn’t know you needed! Location is picturesque and convenient to get to many sites around the area (lots of literature provided by owner for ideas and directions). Owner (Jennifer) is very gracious and I feel like she would be quick to respond to any needs or issues (we had none due to her thoroughness in explaining workings around cabin). A place comfortable for all ages: large deck, fire pit, a place to fish (and poles), very easy access to lake. Loved it! We thouroghly enjoyed our stay here! We recommended this property to a number of our family and friends for future use. Thanks Jennifer for being a great host! First, everything in the house was spotless. The beds were very comfortable. Outside was great also. Awesome fire pit. We used the row boat and paddleboat. Grandkids enjoyed the lake from the dock. Location was incredible. 3 mile to Sam's Club in Traverse and 3 or 4 miles to Interlochen. We just had a great time. Picnics, dune climbs, and beaches during the day and fire pit and lake fun in the evening. We loved our stay! It was more than what we expected, the house was totally equipped and ready for a family of four. We had lots of fun and enjoy the attractions around the area. Even though the weather was not on our side, we still were able to enjoy our time at the lake since Jennifer provided us with a paddle boat and a beautiful patio to enjoy. We were also able to use the fireplace and firepit in those cold nights. We totally recommend this place and hope to be back next year. Ice Fishing, Sleeping Bear Dunes, Traverse City Film Festival, Beach Bums Baseball Stadium, Wine Tours, An Abundance of Golf Courses, Leelanau Sands Casino, Turtle Creek Casino, Interlochen Center for the Arts, *Mackinaw Island is 1 1/2 hours away, *National Cherry Festival* and the TC Film Festival. Excellent area to view the fall color changes! Please email for additional rates and/or dates. The rate sheet on this website will not allow more specific and detailed rates. The rental is available off season with a minimum two night stay. Rates and availability are subject to change until payment is confirmed. Thank you!